A high quality skin moisturizing & pore cleansing detox sauna suit pants designed with a fashionable heavy cotton blend outer shell, seamlessly combined with our unique Poly-Bio-Flex fabric inner lining. (NON-NEOPRENE). A specially designed 100% extra-soft durable Sweat-Inducing inner lining fabric that feels like soft leather to help you increase sweat output up to 70% while shaping and sculpting the lower body. BioSweats Poly-Bio-Flex fabric technology is an effective sweat aid which uses natural body heat to increasingly generate intense perspiration up to 70% during workout to help you achieve your weight loss goal faster. 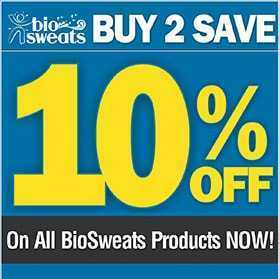 BioSweats Poly-Bio-Flex fabric inner lining uses a sweat excretion process through perspiration to stimulate the entire body, thus helping to rid the body of excess water weight gain, and evenly melts away unwanted body fat and stubborn inches! This weight loss process works just like the expensive saran wrap body treatments offered at exclusive health spas. BioSweats Sauna Pants are durable, tear resistant and machine washable. Bio-Sweats Muti-Purpose Sauna Suit is made with our double layered Poly-Bio-Flex water resistant fabric and is designed for the active lifestyle and ideal for various sporting activities. Bio Sweats can be used as an effective sauna suit, all fitness workouts, weight loss exercise, ski/water sports, water-resistant and warm suit. A high quality skin moisturizing & pore cleansing detox sauna suit mock neck jacket, designed with a fashionable heavy cotton blend outer shell, seamlessly combined with our unique Poly-Bio-Flex fabric inner lining. (NON-NEOPRENE). A specially designed 100% extra-soft durable Sweat-Inducing inner lining fabric that feels like soft leather to help you increase sweat output up to 70% while shaping and sculpting the upper body. BioSweats Poly-Bio-Flex fabric technology is an effective sweat aid which uses natural body heat to increasingly generate intense perspiration up to 70% during workout to help you achieve your weight loss goal faster. BioSweats Poly-Bio-Flex fabric inner lining uses a sweat excretion process through perspiration to stimulate the entire body, thus helping to rid the body of excess water weight gain, and evenly melts away unwanted body fat and stubborn inches! This weight loss process works just like the expensive saran wrap body treatments offered at exclusive health spas. BioSweats Sauna Jacket is durable, tear resistant and machine washable. Bio-Sweats Muti-Purpose Sauna Suit is made with our double layered Poly-Bio-Flex water resistant fabric and is designed for the active lifestyle and ideal for various sporting activities. Bio Sweats can be used as an effective sauna suit, all fitness workouts, weight loss exercise, ski/water sports, water-resistant and warm suit. A high quality skin moisturizing & pore cleansing detox sauna hooded jacket, designed with a fashionable heavy cotton blend outer shell, seamlessly combined with our unique Poly-Bio-Flex fabric inner lining. (NON-NEOPRENE). A specially designed 100% extra-soft durable Sweat-Inducing inner lining fabric that feels like soft leather to help you increase sweat output up to 70% while shaping and sculpting the upper body. BioSweats Poly-Bio-Flex fabric technology is an effective sweat aid which uses natural body heat to increasingly generate intense perspiration up to 70% during workout to help you achieve your weight loss goal faster. BioSweats Poly-Bio-Flex fabric inner lining uses a sweat excretion process through perspiration to stimulate the entire body, thus helping to rid the body of excess water weight gain, and evenly melts away unwanted body fat and stubborn inches! This weight loss process works just like the expensive saran wrap body treatments offered at exclusive health spas. BioSweats Sauna Jacket is durable, tear resistant and machine washable. Bio-Sweats Muti-Purpose Sauna Suit is made with our double layered Poly-Bio-Flex water resistant fabric and is designed for the active lifestyle and ideal for various sporting activities. Bio Sweats can be used as an effective sauna suit, all fitness workouts, weight loss exercise, ski/water sports, water-resistant and warm suit.